We all have jobs where we use our talents with varying degrees of success. Sometimes you get to do what you love; sometimes you get to do what you’re great at; sometimes the things you love and the things you’re great at don’t overlap, let alone equate to a job. The rare alignment between passion and profession is worth celebrating. So hopefully the drummer for this children’s band is extremely stoked that, while what they are ostensibly there to do is keep the rhythm while the rest of the band performs a sprightly, lilting chant, they get an opportunity to also absolutely torch it on the kit. A brutal series of trilling triplets on the hi-hats sets the stage for the double kick-drum assault, and it all finishes with an appropriately hardass rock flourish alongside a kawaii wave. 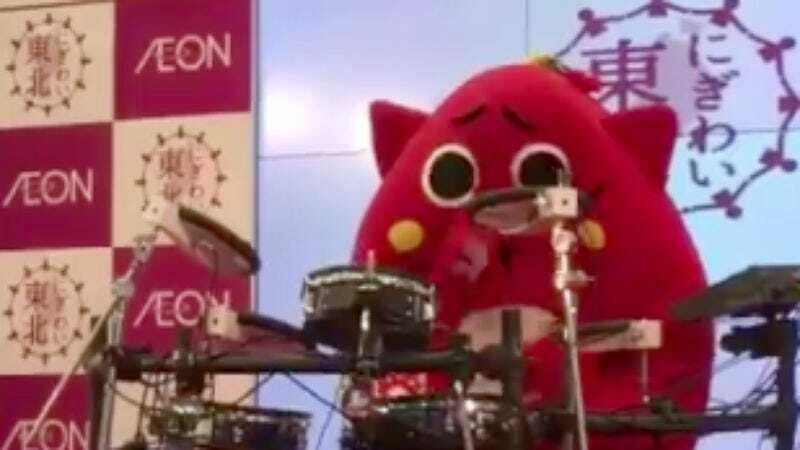 The obvious comparison to make here is to Babymetal, the shredding J-pop sensation that first confused and delighted the world a few years ago, but to be honest this brave drummer’s fusion is a little more interesting. Death-metal drums and children’s pan flutes sound surprisingly good together.